Would you be glad seeing your baby wearing the coolest styles in town? Or perhaps those clothes that are considered to be retro-inspired, trendy and even fashionable? And who thinks babies are not included in the fashion's world so to speak? Babies are gorgeous models! Who knows? And parents can be filled with glee just watching their tots wearing those baby clothes that once they wore during their younger days, LOL! But you have to check these baby clothes online so you would know what I am talking about. There are lots of types which you can choose from when shopping for your baby clothes such as designer baby clothes, and trendy designs for your infants or toddlers. In fact, I am bookmarking this site for my shopping later. I don't have any small kids, but I am actually planning to buy some few gifts for my tiny nephews and nieces in the Philippines. It's such a perfect timing finding this site just in time for my travel to my country this April :). 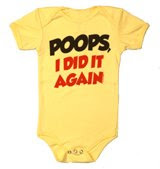 I actually like some onesies (like the photo above) for my smaller nephews. It's kinda cute letting them wear those and will take photos of them doing their innocent poses :). It would be cool! And guess what? They are offering 50% discount sale. You have to take this opportunity fast so you can save, don't you think?